A few hours later I received a counteroffer from the seller which I accepted. The seller was in Peru so now it was time for the dreaded wait. When the pipe finally arrived I was eager to tear into the box to see what I had! When I took the pipe out of the protective wrapping my first thought was “Wow, this thing is tiny!”. I have one over System pipe that is an XL315, a pretty large pipe. I didn’t realize the 313 was going to be comparatively diminutive in size! 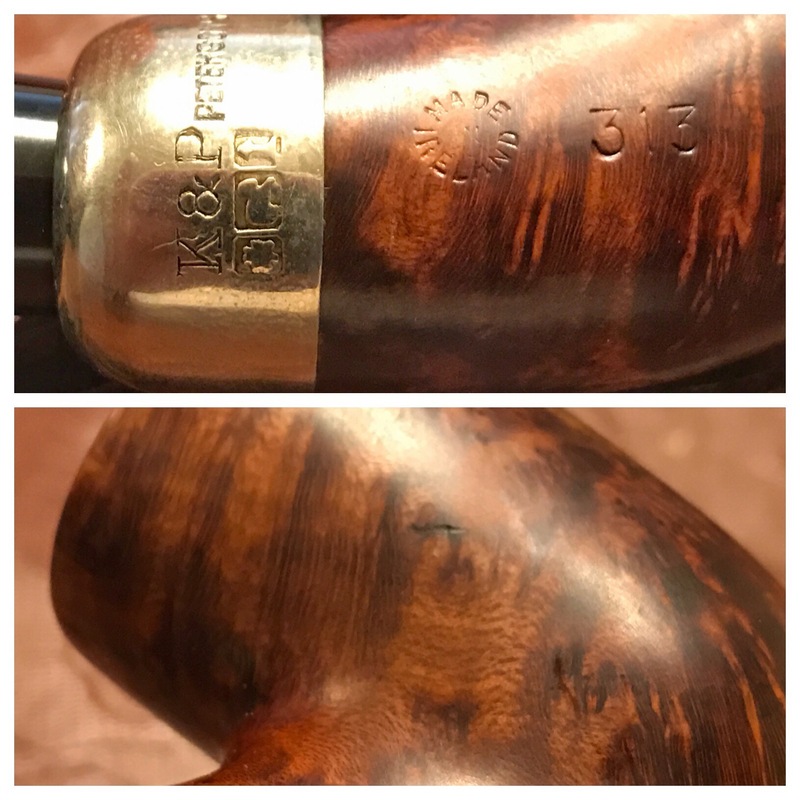 I was pleased to see that the nomenclature was stronger than I expected it to be and that the pipe was in pretty well as-shown condition; there was a deep burn on the front, inside of the bowl that I didn’t make out in the photos. Here are a few pictures I took upon getting the pipe unpacked. I dropped the stem in a warm Oxiclean bath while I began to clean the dirt and grime from the stummel. As I removed years worth of crud with cotton pads and both alcohol and acetone I began to really like what I was seeing! There were a few issues showing up now, but not anything too major: the rim cleaned up well but was burned worse than I thought, the nickle band had loosened over time and move up a little and was stained with tars (I think). All of these things were in my mind a good trade-off for the better than expected stamping though. When I took the stem from the Oxiclean bath I scrubbed it down with a magic eraser to take off the loosened oxidation. Here’s what the pipe looked like at his stage; you can see the line where the band has moved over time. It was now time to start cleaning the internals of both the stem and stummel. As I mentioned, this pipe has a rather small bowl; my smallest cutter on my PipNet set wouldn’t fit inside the bowl to ream it! The cake was hard but not terribly thick so I used the blade on my Sheffield pipe tool and some 320 wet/dry paper to ream back to bare briar. while I was doing the reaming I found was the burn on the rim was soft and would require more than just topping it. I decided to finish the internals before turning my attention to this problem. I took a cotton swab soaked in alcohol and ran it through the stem; the P-Lip stem has a graduated airway, starting out very open and narrowing as it get closer to the button. As I turned the stem over to scrub the inside with the cotton swab a horrible goo ran out of the P-Lip! Needless to say, the pile of cotton swabs and pipe cleaners were only a representative sample of what it took to get the stem clean. And the well/mortise and airway of the pipe was equally nasty’ I really hadn’t expected this given the maintained cake in the bowl. I stuffed a cotton ball in the bowl and a cotton swab in the air hole, filled the bowl with alcohol and left it to sit over night. I completed cleaning inside the stem before going to bed. The next day I removed the tar-stained cotton ball and swab from the stummel and began to work on the burned rim issue after the pipe had dried an hour or two. I began by topping the bowl with 320 wet/dry sandpaper, checking my progress often. There was another smaller darkened area I wanted to remove, too, if I could, but I didn’t want to remove more briar than I had to.When the smaller spot was gone and the worse spot was improved I wiped the bowl down with alcohol to clean any remaining dust from it’s surface and began to polish it with micro mesh. I got up to about 2400, I think, and decided the burn was still too noticeable. I went back to work on the rim with a folded piece of 320 grit paper and worked a bevel on the inner edge of the bowl, then repeated polishing with micro mesh as before. The results were much better to my eye. I moved on to the stem now, setting the bowl aside for later. The stem wasn’t in particularly bad shape, mostly just oxidized, as some of the previous photos show.There was a couple of deeper tooth marks on the bottom and top near the button that had to be filled. I sanded the oxidation off using 320 grit paper then cleaned the stem well with alcohol on a cotton pad. I picked at the deepest dents and the button “steps” with a small “toothpick” knife I have to make sure all the oxidation was out of the dents and grooves. After giving the areas a spray of CA glue accelerator I applied clear CA glue to both spots, gave it another spray and then let it sit a few hours to cure well; I didn’t want the glue to run while it cured or I might have skipped the accelerator altogether. (I didn’t remember to take many photos during this process.) After the glue cured I used needle files and sandpaper to smooth and better blend the patches, after which I polished the stem with the full range of micro mesh pads, 1500-12000. Now that the stem and stummel were fully ready, I moved to the downstairs workshop for the finishing touches on everything. I began with my heat gun, warming the band to expand it and press it back in place; I pressed it into an old buffing wheel, using the center hole to help fix the slight out-or-roundness that had gotten in the band, too. Next I used a dark brown stain pen to re-stain the bowl. I covered it entirely, as evenly as possible, twice and let it dry for a little while before using another alcohol dampened cotton pad to wipe off some of the excess to allow the grain to shine through. Next up was buffing with the Dremel. I used brown Tripoli on the stummel and nickle band first and then white diamond and blue compound on both the stummel and stem. I finished up with a few coats of carnauba wax on the entire pipe and a hand buff with a micro fiber clothe to raise a nice shine. I am really pleased with how the pipe came out overall and think the beveled rim idea to fix the burned area blended in very well. Before you see the finished pipe I must confess the first bowl I smoked in it was horrid! I had to go back and do a second alcohol treatment and I soaked the stem in alcohol and cleaned it again, too. The second cotton ball was even more tar-stained than the first! I had to re-wax and buff the whole pipe, too. But the next bowls proved it was well worth the effort as the pipe now smokes dry and sweet! This entry was posted in Pipe Refurbishing Essays and tagged beveling the inner edge of the rim, p-lip, Polishing a pipe with a Dremel, repairing tooth dents, staining, superglue patches on the stem, topping a bowl on December 10, 2016 by Greg. Very nice work Greg. Great looking pipe you have there. what “advice” re: use of a Dremel, Greg? i’ve been intrigued by this methodology for awhile now (currently, i use a Harbor Freight bought, double buffing wheel machine, w/ a standard RPM adjuster affixed to keep the RPM’s low). anyway, lovely job (intense) on the “Pete”, man… she looks like my own 317 (“diminutive” indeed, though she was not Pre-Republic – unfortunately). i sold her though she’s now in good, Irish hands (my buddy). like others, i dig how you beveled her out; i think it actually looks more appealing than original shape/ design (but that’s just me). nice work indeed… i’m sure you’re very proud – as well you should be. Thank you for the kind words. I am very happy with the little gal and how she turned out. groovy. thanks ever so much, Greg; much obliged to both you & Mr. Dal. Very nicely done Greg! I hope it brings you many a fine smoke. Good find, and a great job refurbishing it.The work you did on the burned rim came out especially nice. Most Pre Republic pipes I have are of similar size.but few in as nice of shape as yours. Congratulations on this one, and I hope you find many more. That’s a good-looking Pete, Greg! Nicely done. Very nice, I love those smaller, pre-Republic Pete’s! That is definitely a Pre-Republic. I can’t quite make out the stamping, but it appears to be the round “Made in Ireland”. From PipePhil: “The country of manufacture stamp changed from “Made in Eire” to “Made in Ireland” (In circle) about 1945 (this pipe). Later (1947-49) it became “MADE IN IRELAND” (block letters) stamped in one or two lines.” Great job on the bowl top. That one must have had a fill or two to keep it from being a Deluxe or higher – a very nice find! Al, I finally got around to adding a photo of the nomenclature today, along with the defect that you mentioned probably kept it from being a higher grade pipe. Again, thanks for “reminding” me! Nice! I take all my close-up’s with my camera phone, it really zooms in (just a plain-old android), no flash, two desk lamps for lighting. My phone takes a lot better close-ups versus my digital camera set on macro. Nice find, Greg! And a beautiful job on the staining and finish. That’s a keeper! Greg, great job and great find in South America! I don’t have any Petersons in my collection yet, but your new acquisition is very attractive, even though smaller than your used to! Glad the Dremel is still working for you :-). Greg I really like this type of staining. I’ve got a new estate that I want to try it on. How does it work, dark stain first, flame off the excess, let ot sit and repeat with the light stain?